Stupid-haired puppets meets stupid haired puppet. And How Was It For You? 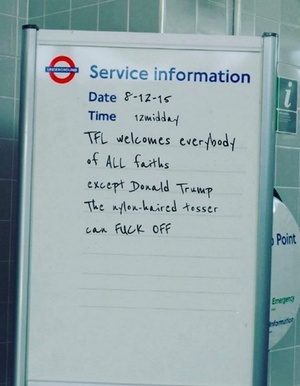 Dear Mr Trump ‘He Started Screaming’ Anything Good On The Tube? 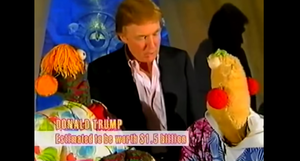 Posted in Misc and tagged Donald Trump, Zig And Zag at 4:29 pm on March 24, 2016 by Broadsheet. He’s not a puppet, he’s a very naughty boy. What a grim view of the world! And if Giselle Bundchen washed my lads, what then? We can all guess what would happen then, Baz. Of course there are more cowardly things, like blaming his problems on minorities, the weak and the powerless, disenfranchised, desperate and paid a pittance. It’s damn cowardly to judge someone without even speaking to them. My reasoning is that we have been through two world wars and done a hell of a lot of politicking* to enjoy what we have and I’m disappointed that an educated adult would resort to a crotch reference in support of our civilisation. *That’s a reference to the various European unions going back hundreds, maybe thousands until we all learned not to burn the place down every thirty years. Ah so you choose to ignore mass genocide in the former Yugoslavia, 50 years of casual murder on this island , I could go on, Europe is a mess today, fool yourself otherwise. Political cowardice has us in this mess. Oh my holy God. This man could be president of the US. 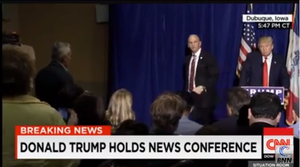 It’s really looking like him versus Hillary (‘Hitler or Hitlery, take yer pick’ as Gerald Celente says). He will win in the mud slinging contest that is the presidential race. Hillary can’t win with her skeletons. Well. At least he’ll get on well with Putin. Zig and Zag with Putin. I’d say that’d be enjoyable TV.